GREEN-FINGERED volunteers in Mirfield are celebrating after picking up a string of awards in the Yorkshire In Bloom competition. 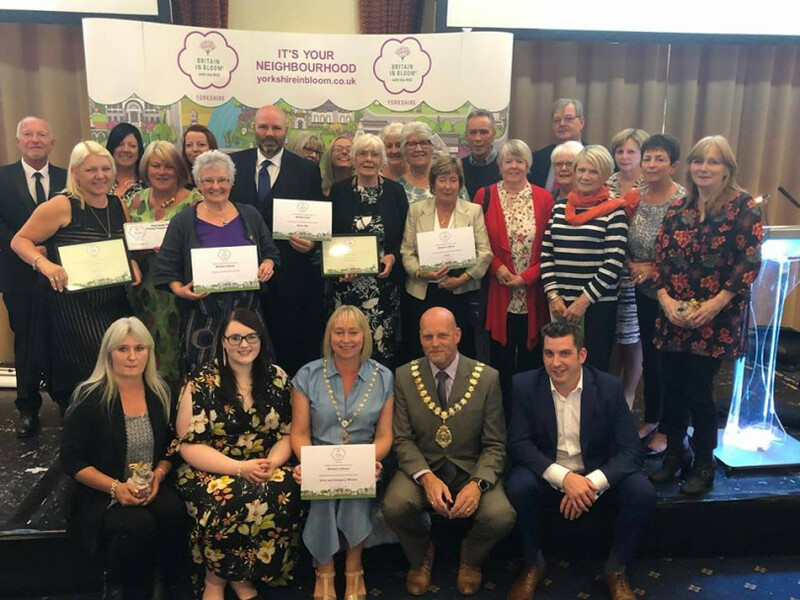 Members of the Mirfield In Bloom group travelled to York on Tuesday night for a ceremony where they collected a gold award and were named as the best large town in Yorkshire for their floral efforts. A committee was formed in autumn last year in the hope that they could bring the community together while sprucing up parts of the town. The idea was spawned between Ruth Edwards and Hopton in Bloom’s Christine Breare – and now the team includes Tim Grace, Helen Walker, Christine Sykes and Barbara Clough, as well as many other volunteers and organisations. Businesses, schools and nurseries got involved, with new hanging baskets, planters, floral displays and flowerbeds all appearing. Volunteers went litter-picking by the canal and spruced up the railway station, while staff and youngsters at Church House Pre-School created a stunning new display in the old boat situated close to St Mary’s Church. As well as planting flowers and cleaning up the town, the Mirfield in Bloom team hope to encourage more civic pride, which in turn could help boost the town’s economy through increased footfall and tourism. On Tuesday night all their hard work was rewarded when they won a number of accolades. Mirfield was named as the joint best large town in Yorkshire with Knaresborough, but overall Mirfield was judged to be the best town in category (out of small, medium and large towns). Other local initiatives were also entered separately in other categories. Battyeford Primary School and Church House Pre-school won silver gilt awards, and Mirfield Co-op picked up a silver gilt in the medium business category. The St Mary’s Community entry was judged to be outstanding, and Mirfield Promenade was given a ‘thriving’ endorsement. Mirfield in Bloom secretary Helen Walker said: “We are delighted at our first attempt to win such high awards, in particular the gold for Mirfield itself.